Having used standard dry bags for years without problems, I was slow to try a waterproof duffel bag. After all, standard dry bags always kept my gear dry—if rather unorganized. And an overnight float trip through remote terrain isn’t an ideal time to “experiment” with a new dry bag. NRS Expedtion Duffel Bag. Perfect for gear organization. See more duffel bags at NRS. When the first waterproof duffel bags hit the market many years ago, the quality of the bags wasn’t especially good. The first waterproof duffel bags often developed leaks, sometimes opened unexpectedly, and weren’t easy to open or close. 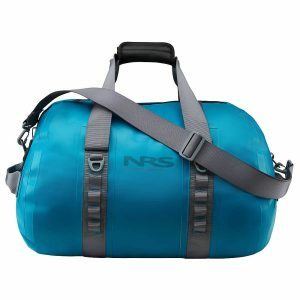 Yet, for a multinight float trip I planned for the Yellowstone River, I bought a waterproof duffel bag (Expedition Series) from NRS, since I needed a long but slim bag to hold my clothes. I also wanted a dual-purpose dry bag, which could work as a “normal duffel bag” when not floating. Because of the variety of waterproof duffel bags available, I’ve prepared this guide. It’s my hope this article will help people select the right waterproof duffel bag for their particular needs. The Benefits – Waterproof duffel bags are simpler to pack, organize and locate gear compared with standard dry bags. Waterproof duffel bags also take up much less space than standard dry bags of similar capacities. Their smaller size makes them ideal for float trips, motorcycle camping and other activities where a person needs to protect their gear from the elements. For Float Trips & Motorcycle Camping – Buy a true waterproof duffel bag, not one that’s just “water resistant.” Don’t get too large of a bag. Instead, get one (or two) that are just large enough for your specific needs. 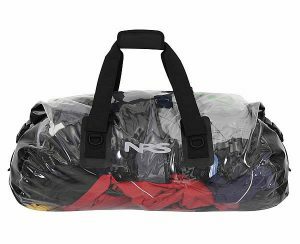 The best place to buy true waterproof duffel bags is through NRS. Water Resistant Duffel Bags – Water resistant bags have a waterproof shell but not a waterproof enclosure. These bags work fine for many around town uses, but fail completely for float trips, motorcycle camping or other activities where the bag is exposed to harsh, wet weather. Waterproof duffel bags provide many benefits compared with standard dry bags. The beauty of waterproof duffel bags are their multiuse ability. Besides working superbly to protect and organize gear on overnight floats, waterproof duffel bags have many uses. They are excellent waterproof bags for car camping, bike camping and—especially—motorcycle camping. Their large capacity yet compact size allows for great versatility in their use, even for such mundane tasks as carrying gym gear in wet weather. Standard dry bags are bulky because of the air trapped inside the bag (by design). While this allows the bag to float, the air takes up considerable space. In contrast, waterproof duffel bags roll up tightly and have no “wasted space” caused by trapped air. This allows duffel bags to have the same capacity as larger standard dry bags. Waterproof duffel bags are far simpler to pack and unpack. Their shallow depth and wide opening makes it simple to find gear inside the bag. Waterproof duffel bags avoid the problem of “dry bag diving” in search of gear. Waterproof duffel bags make organizing gear much simple compared to standard dry bags. The cylindrical shape of standard dry bags makes organization a chore, especially with larger bags. 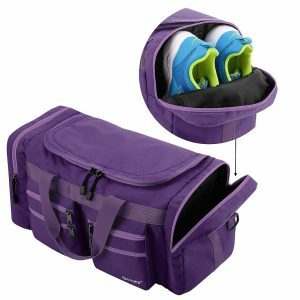 In contrast, the shallower depth and wide opening allows for easy organization of gear. Packing a waterproof duffel bag is no different than packing a normal duffel bag or suitcase. Clear dry bags make finding gear inside the bag much simpler. Anyone who has “dry bag dived” knows how difficult it sometimes is to find small clothing items. And for standard cylindrical dry bags, I always suggest buying a clear bag. NRS Colored Duffel Bags are good for “privacy” of one’s gear. See more duffel bags at NRS. However, waterproof duffel bags aren’t nearly as deep or tall as standard dry bags. And unlike standard dry bags, they have a wide opening. In many ways, opening a waterproof duffel bag is just like opening a normal duffel bag used for the gym. Because of their shallower depth, finding gear is simpler and reduces the need for a clear bag. Moreover, clear bags have their own faults—in particular, a lack of privacy. For general float trips that involve camping, this isn’t an issue. However, for an “around town” waterproof duffel bag or one used for motorcycle camping, a colored dry bag provides more privacy for the bags contents. Whether to choose a clear or colored bag is a personal preference. Just don’t rule out a colored duffel bag, since duffel bag design makes finding small items much easier than standard dry bags. Waterproof duffel bags, just like standard dry bags, are available in a wide variety of sizes. Since the cost difference between a medium or large duffel bag often isn’t large, it is tempting to buy the larger bag. NRS Tote Bag. Designed for easy carry of gear on and off the water. 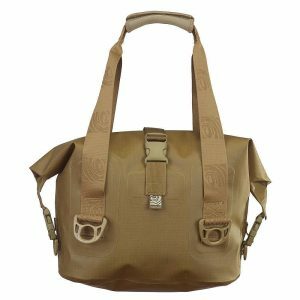 See more totes & duffel bags at NRS. However, smaller bags are easier to handle and to close. Smaller bags are also lighter. Smaller bags also hold gear more tightly. Finally, smaller bags are, obviously, more packable. What size duffel bag to buy is a personal decision based on a person’s needs. My suggestion is to buy a duffel bag with just enough capacity for your needs. While buying two bags costs more, the extra cost is worth the improved organization and flexibility that two duffel bags provide. When shopping for a waterproof duffel bag, be sure to buy a bag that is waterproof and not just water resistant. While this sounds simple, in practice it isn’t. Many duffel bags claim to be waterproof. But a closer reading of the technical details often shows the bags are water resistant, not waterproof. Generally, these bags have a waterproof nylon shell—leading to the waterproof claim. However, the bags use normal zippers which are not waterproof. In short, these “partially waterproof” duffel bags have a waterproof shell but allow water inside the bag through the zipper. These bags work well for “around town.” Especially popular as gym bags. See more water resistant bags at Amazon. For going to the gym or car camping, a water resistant bag might be all that’s needed. However, for floating trips or motorcycle camping, using water resistant duffel bags are a recipe for lots of wet and destroyed gear. Because of this, anyone who needs a waterproof duffel bag for motorcycle camping or overnight floats should shop for their bag at NRS. At NRS, all bags are genuinely waterproof and designed for the rigors of float trips and motorcycle camping. To phrase it differently, waterproof duffel bags from NRS will keep gear dry through the wettest and harshest conditions. Water resistant bags, by contrast, keep gear dry when a light spring shower arrives. Despite how wonderful waterproof duffel bags are for float trips, a small or extra-small dry bag is handy to have. Small/Extra-Small dry bags are ideal for storing “day use” items, such as sunscreen, sunglasses and similar items. And for day floats, a small dry bag is ideal for storing items such as purses, wallets, car keys, smartphones, etc.. In short, waterproof duffel bags are a superb substitute for larger, bulkier standard dry bags. They are excellent for storing clothes, camping gear, and much more. But for times when a person just needs “something” to carry small amounts of gear, a small or extra-small dry bag is needed. Waterproof duffel bags have several D-Rings or other attachment points on the bag. However, straps or marine rope is needed to attach the bag to the boat. Attaching the bag to the boat prevents the bag from sinking or floating away in the event the boat capsizes. An ideal method to attach any dry bag to a raft is to tie a carabiner to each end of a short length of marine rope. This makes attaching/detaching the bag from the raft simple. Because of their specialized nature, waterproof duffel bags are difficult to locate offline. Stores that specialize in water sports sometimes sell a few. Additionally, REI and Cabela’s sometimes have a small selection. Many waterproof bags are also available through Amazon. However, many waterproof bags sold through Amazon are water resistant, not waterproof. So pay close attention to the technical information and product description of the bag before purchasing it. Remember, for float trips and motorcycle camping, using a true waterproof duffel bag is crucial to keep gear dry.